You may access these tools from the Reports menu in the Textboom toolbar. The Message Log reporting feature displays a listing of all SMS messages. You can filter for successful distributions, unsuccessful attempts, or exclude specific log types and status indicators from the report. There is also an option to restrict the date range. You can also search for a specific term, such as a number or a word. Or, you can choose from several value- specific filters such Select Carrier, Select Shortcode, Select Agency, or Select Client. The listing will change to match any filters that you apply, and you can combine several filters to make your report very specific. To clear away any filter, you can perform a reset at any time. Once you have the results that you seek, you can export the data to a comma-separated value (CSV) text file. Read below to learn how to prepare your report. You may access this feature by choosing Reports > Message Log from the toolbar. After choosing this menu item, you will see a page having the characteristics which we describe below.  MT – Message Terminated: Message sent from the platform to subscribers cell phones.  MO – Message Originated: Messages sent from cell phones to the platform.  WO – Widget Originated: Messages generated from the web widget. As you can see, there are many Status types. These correspond to the values that are found in the Status column in the listing. Unchecking a Status box will cause that status value to filter out of the listing. For example, unchecking all Status boxes except for Pending will change the listing to display on those records having a Status of Pending. Click the Go button to update the listing; click the Reset button to revert back to the original filter settings. Here you can choose a beginning (From) and ending (To) of date range that will restrict the records that appear in the results. Click the From calendar icon (for example, choose April 1). Then, optionally, choose the hour (HH) and minutes (MM) that will define the precise time for the start of the report date range. Also choose AM or PM from the drop-down. You could enter 9:00 AM. Next, click the To calendar icon (you might choose April 30). Then, optionally, choose the hour (HH) and minutes (MM) that will define the precise time for the start of the report date range. You could enter 5:00 PM. Click the Go button to update the listing. Only the records that fall within the date range will appear in the results. Click the Reset button to revert back to the original filter settings. Immediately above the column headings, you’ll find a Search field (see the figure below). Here you can enter a specific value, such as “Chicago” or “15615551313”. Click the Go button to initiate the search. Any records containing the value in the Search field will appear in the results. To the right of the Search field, you’ll find a number of other filters: Select Carrier, Select Shortcode, Select Agency, or Select Client. You can choose values in one or more of these drop- down menus to further restrict the report listing. As you choose drop down menus, other will appear that will continue to restrict the report. As seen below, when you select a Client from the drop down menu, the Database and SMS Campaign filter will appear. Click the Export icon in the upper right corner of the page. When the window appears, choose the location in which you want to save the CSV file. The figure below displays the first few column headings. Underneath these headings, you will see all of the messages. The Email Log reporting feature displays a listing of all Email messages that were sent. You can filter for successful distributions, unsuccessful attempts, or exclude specific types and status indicators from the report. There is also an option to restrict the date range. You can also search for a specific term, such as a number or a word. Or, you can choose from several value- specific filters such Select Carrier, Select Short code, Select Agency, or Select Client. You may access this feature by choosing Reports > Email Log from the toolbar. The Network Log reporting feature displays a listing of all Network Look Up that were preformed. You can filter the report, if need be. There is also an option to restrict the date range. You can also search for a specific term, such as a number or a word. Or, you can choose from several value-specific filters such Select Carrier, Select Shortcode, Select Agency, or Select Client. You may access this feature by choosing Reports > Network Log from the toolbar. After choosing this menu item, you will see a page having the characteristics which we describe below. The Batch Upload reporting feature displays a listing of CSV batches that have been uploaded for your account. You can filter by type OC (Operating Company), Agency, or Client. There is also an option to restrict the date range, and you may also search for a specific word or number. On the left side of the report control panel, you’ll find a group of filters (below). Choose from one or more of these drop-down menus to filter by OC (Operating Company), Agency, or Client). Along with these filters, you’ll find a Search field. Here you can enter a specific value, such as “Chicago” or “15615551313”. Click the Go button to initiate the search. Any records containing the value in the Search field will appear in the results. Click the Go button to update the listing; click the Reset button to revert back to the original filter settings. The figure below displays the first few column headings. Underneath these headings, you will see all of the batches. Here you can also see the original file and result file of the batch upload. Both of these files can be downloaded to your computer – simply click on the box/green arrow and follow the prompts. The Invoicing Support reporting feature displays a listing of potentially billable elements to assist you in with invoicing. You can filter by type (OC (Operating Company), Agency, or Client) or Entity Name. You can also search for a specific word or number. You may access this feature by choosing Reports > Invoicing Support Report from the toolbar. After choosing this menu item, you will see a page having the characteristics which we describe below. On the left side of the report control panel, you’ll find a group of filters (below). Choose from one or more of these drop-down menus to filter by OC (Operating Company), Agency, or Client. Along with these filters, you’ll find a Search field. Here you can enter a specific value, such as “Chicago” or “5551313”. Click the Go button to initiate the search. Any records containing the value in the Search field will appear in the results. Click the Export icon in the upper left corner of the page. The figure below displays the first few column headings. Underneath these headings, you will see all of the billable elements. The Opt-Out reporting feature displays a listing of all opt-out events. You can filter by type OC (Operating Company), Agency, Client, or Short Code. There is also an option to restrict the date range. You can also search for a specific word or number. You may access this feature by choosing Reports > Opt-Out Report from the toolbar. After choosing this menu item, you will see a page having the characteristics which we describe below. On the left side of the report control panel, you’ll find a group of filters (below). Choose from one or more of these drop-down menus to filter by OC (Operating Company), Agency, Client), or Short Code. The figure below displays the first few column headings. Underneath these headings, you will see all of the opt-out events. What is SMS Campaign Performance Report? The SMS Campaign Performance Report gives the user the ability to track, analyze and review campaign performances with this easy-to-use feature via detailed graphs and easy-to-read detailed data sheets. All campaigns, other than Broadcast campaigns, will show a report including tabs: Keyword, Time, Geographic, Carriers and Detailed info. Note: The SMS Campaign Report is updated hourly. Please allow 1 hour for the most up- to-date results. The Keyword tab displays the keyword and aliases defined in the campaign, impressions (or interactions) from each one and the creation dates. The Time tab displays the time distribution of the campaign. The Day of Week Average chart reflects the average campaign interaction for each day. The Hour of Day Average chart shows the average campaign interaction per hour. The Geographic tab shows the location of records as they opt in (MO) based on their zip code. There are 2 tabs of information available: Carriers and Detailed Info. 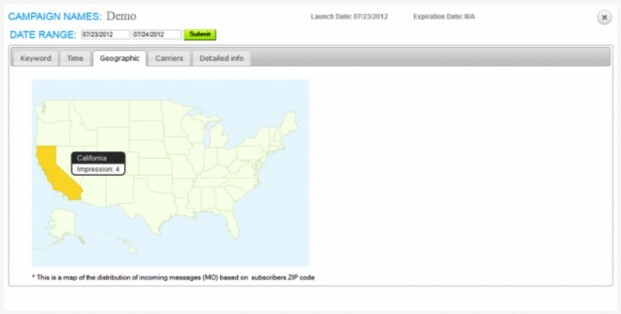 The Carriers tab gives a breakdown of delivery distribution based on carriers and the message status of your campaign. Note: The carrier and status distributions are based on ALL MT & MO linked with the campaign, not just impressions. The Detailed Info tab offers an hourly table of message delivery results per carrier. This is the detailed information behind the Carrier tab. The Utilization reporting feature displays a listing of all statistics for each entity in the system. You can filter by Type (OC (Operating Company), Agency, or Client) or Entity Name. There is also an option to restrict the date range. You can also search for a specific word or number. You may access this feature by choosing Reports > Utilization Report from the toolbar. After choosing this menu item, you will see a page having the characteristics which we describe below. The figure below displays the first few column headings. Underneath these headings, you will see all of the statistics. Immediately above the column headings you’ll find a Search field. Here you can enter a specific value, such as “Chicago” or “15615551313”. Click the Go button to initiate the search. Any records containing the value in the Search field will appear in the results. To the right of the Search field, you’ll find two other filters for Type and Entity Name. You can choose values in one or more of these drop-down menus to further restrict the report listing. Then, optionally, choose the hour (HH) and minutes (MM) that will define the precise time for the start of the report date range You could enter 5:00 PM.